“He’s a true professional. He’s what you look for in a teammate. He never pouts. He just waits for his number to get called. He’s been on the active roster. He’s been on the practice squad, been going back and forth. One thing about Griff, he played at Stanford. He’s been with Pep Hamilton. He understands the offense. He knows Andrew pretty good. He can play any position. “I saw the long face of my head trainer, Dave Hammer, saw a couple of my trainers look at me like, ‘Sorry, dude.’ I already knew what it was. My dark time came from the time (Hammer) told me that I had a torn ACL. From that time it probably went from there until another 2-3 hours. They told me that then I drove home and shared the news with my family and kind of put my head together with my family and figured out what I was going to do from that point on, along with a couple of tears, here and there. Down 17-3 and having been out-scored 69-6 in the first halves of the last three games, the Colts captured something that led to another comeback win, this time at Tennessee, 30-27. That something was ‘Mo’ – momentum. It started on a 68-yard drive in the final 2:32 of the first half when the Colts navigated for an Adam Vinatieri 30-yard field goal at the gun. An 18-year veteran, Vinatieri can sense intangibles, and he felt it when the club narrowed its halftime deficit to 17-6. The Colts shaved the margin closer with a 74-yard march where Luck converted third downs with passes to T.Y. Hilton and Griff Whalen. He even scrambled 13 yards for a first down. 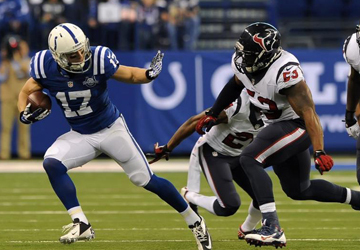 To close the final 14 yards of the march, Luck connected with Hilton for eight yards, then Donald Brown burst off left tackle for the score. The ball came out on the ensuing kickoff return and special teamer Daniel Herron made a play. Pat Angerer notice how ‘Mo’ visited a number of teammates. Be it Luck, luck, the horseshoe or ‘Mo,’ it’s better to have than not. As T.Y. Hilton walked into the Colts locker room at halftime on Sunday night, his “big brother” wanted to have a few words with him. Hilton had one catch for six yards in the first half and a third-down drop was eating at the second-year receiver. 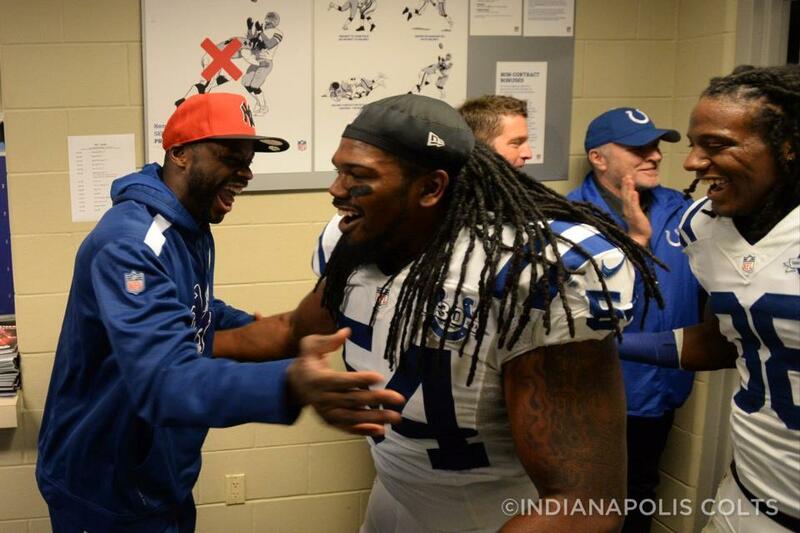 Reggie Wayne pulled the young receiver aside for a message. “(Wayne) looked me in the eyes and told me, “You owe me one, man. Just go out there and do what you do best, just go out there and have fun,” Hilton said on Monday recalling the story. Hilton’s definition of “fun” turned out to be six catches for 115 yards and a career-high three touchdowns. When Wayne went down, the popular consensus was that his production would not come from one particular individual but rather a group of receivers. 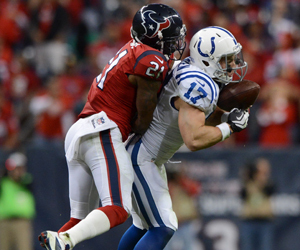 Yet, on Sunday night there was Hilton carving up the Texans secondary in helping the Colts erase a three-score deficit. As the final gun sounded and Hilton jogged off the Reliant Stadium field on Sunday night, he knew who was waiting for him when he entered the visiting locker room. “After the game (Wayne) said, “Now that’s what I’m talking about. That’s what I’m talking about.” We just kind of took that moment in,” Hilton said of their locker room interaction. The attention towards Hilton will only grow in the coming weeks as his ability to change the game with a single touch must be accounted for by opposing defenses. For one night it might not have been a “committee” that replaced No. 87, but Hilton did his best to carry out Wayne’s halftime wish. For the better part of the last two weeks, the questions on who would replace Reggie Wayne were frequently asked around the Indiana Farm Bureau Football Center. The common answer from Colts personnel was it would be a group effort. However, on Sunday night it was one key member of that committee who received the bulk of the reps.
Whalen played 40 offensive snaps (65 percent) which was the second most for any Colts receiver. His three catches for 32 yards were a career-high as he saw extensive action for the first time in his NFL career. The highlight from Whalen came with the Colts down 24-19 and facing a third-and-10 with 5:57 to go in the fourth quarter. With future Hall of Famer Ed Reed draped over Whalen, the second-year receiver hauled in a 17-yard reception to move the Colts to the Texans 35-yard line. Three plays later there was T.Y. Hilton with the game-winning touchdown. “Griff (Whalen) made some crucial (catches), big third-down catch there on the last drive,” head coach Chuck Pagano said after the game.